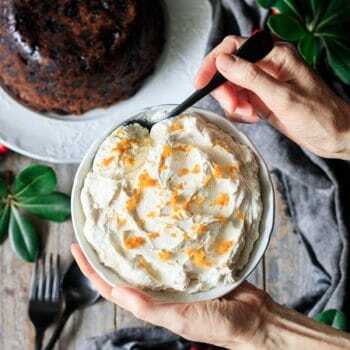 Brandy butter, a sweet and fluffy blend of butter, sugar, brandy, orange zest, and vanilla, is the traditional accompaniment to plum pudding at Christmas. 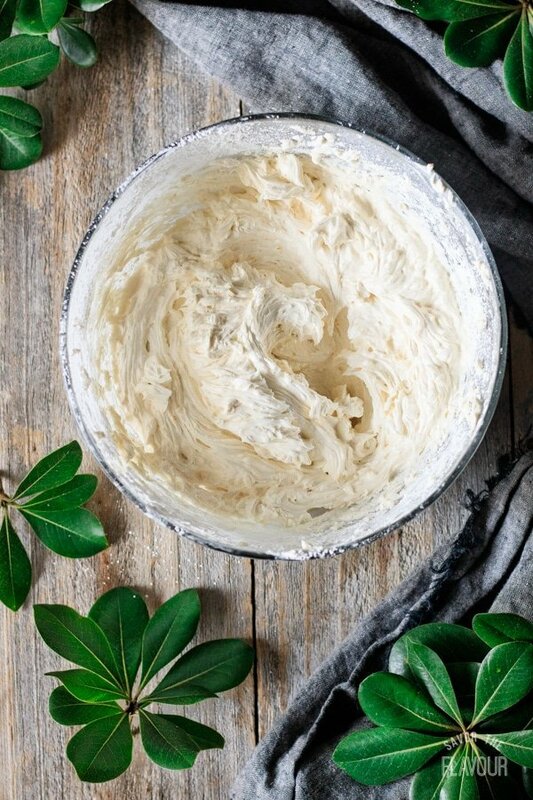 Just mix together the ingredients in one bowl to make this delicious gluten free brandy butter. 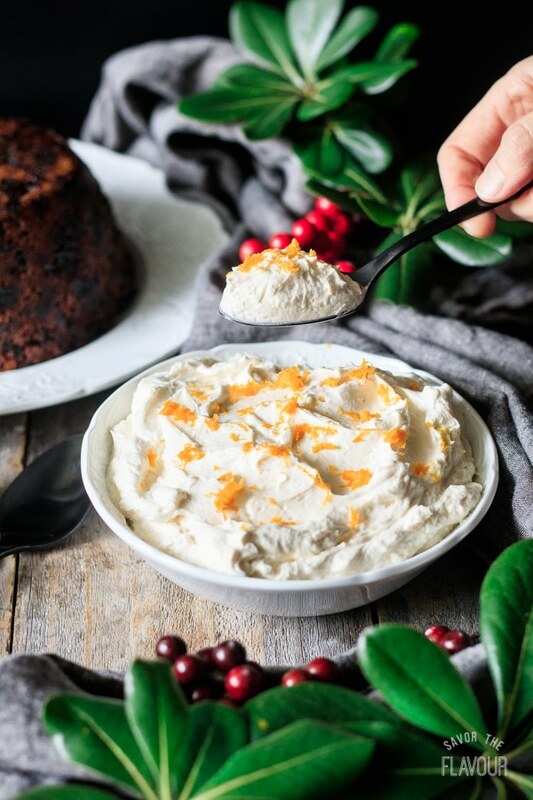 Everyone will love this classic sauce with plum pudding, bread pudding, or mince pies during the holidays! Have you ever had brandy butter–also called hard sauce? 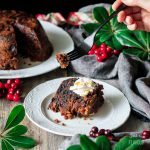 It’s a delightful combination of butter, sugar, and brandy, with some additional flavoring from vanilla and orange zest, and is traditionally served on top of a warm slice of plum pudding. All that buttery goodness melting into a moist, fruity cake? Sounds yummy to me! Fortunately, brandy butter is super simple to make, and can be made weeks in advance! If the brandy butter curdles, that probably means you’ve added too much brandy. Mix in some more sifted icing sugar until the butter becomes smooth again. 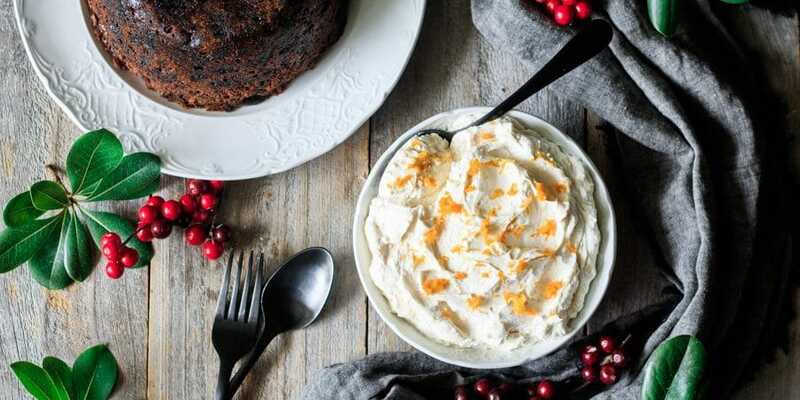 Any warm, heavy dessert goes well with brandy butter. Here are some ideas to get you started, although feel free to experiment! How long does brandy butter keep? 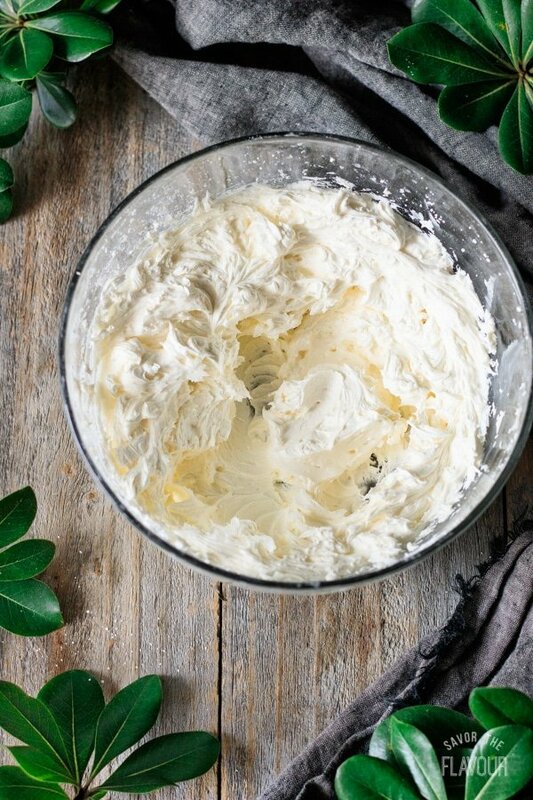 Store brandy butter in a sealed container in the fridge for 2-3 weeks. Can you freeze homemade brandy butter? Yes, you can freeze homemade brandy butter in an airtight container for up to 3 months. Eat within 1 week of thawing. Can brandy butter go bad? Yes, brandy butter can go bad. The sugar and alcohol in it will help it not to spoil as quickly as regular butter. If the brandy butter tastes, smells, or looks strange, then just throw it out. You can prevent it from going bad by storing in the fridge for up to 2-3 weeks, then freeze any leftovers if you need to keep it for longer. Grab some icing sugar, butter, vanilla extract, orange zest, and brandy. Put the butter in a bowl and sift the icing sugar on top. Beat the butter and sugar together until lightened in color and fluffy. Add the vanilla, orange zest, and brandy until you like the flavor. Serve immediately or refrigerate for later. Use a mix of salted and unsalted butter. The salt will help cut the sweetness. Sift the icing sugar to prevent lumps of sugar in the brandy butter. Add the brandy gradually until you like the flavor. Accidentally add too much brandy? Add more icing sugar and vanilla until you like the taste. 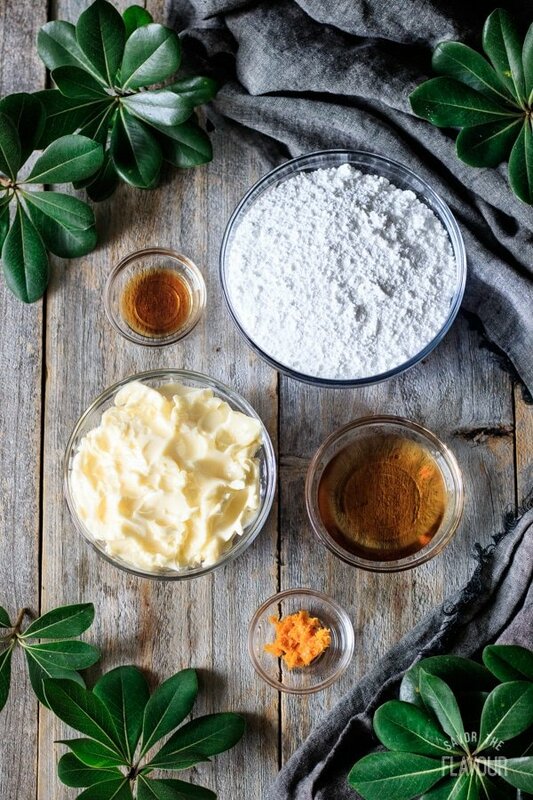 Tweak the amounts of icing sugar, vanilla extract, and orange zest to your taste. 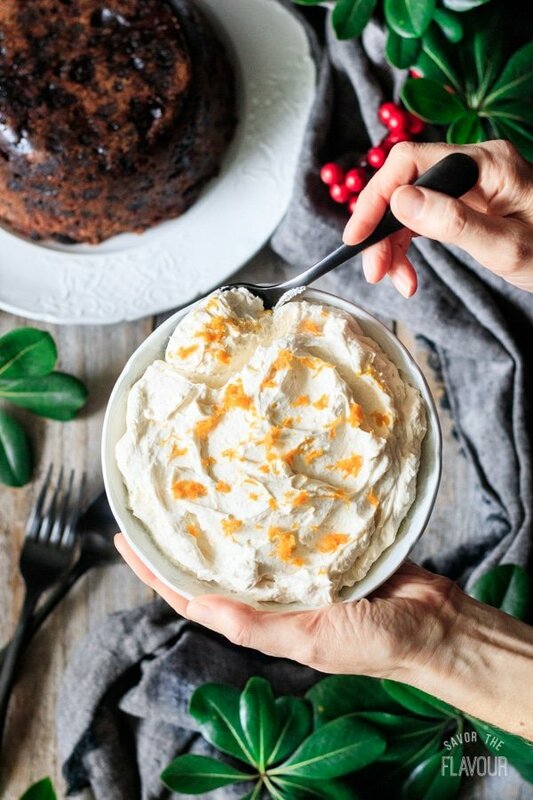 Store the brandy butter in the fridge for up to 2 weeks, then serve it cold with warm plum pudding, mince pies, bread pudding, or other desserts. Freeze the brandy butter for up to 3 months. Use within 1 week of thawing. 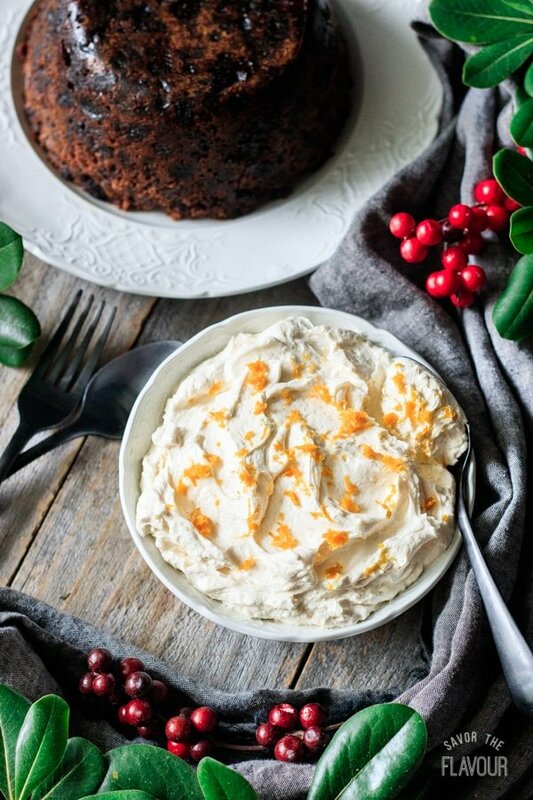 Serve brandy butter with these delicious Christmas desserts. Plum Pudding: this moist, fruity pudding is an easy make ahead dessert everyone loves. Mincemeat Tarts: delightful Christmas pastries packed with rich mincemeat baked inside flaky pastry. Lincolnshire Plum Bread: this yummy yeast bread is jeweled with dried fruit and flavored with spices. Did you make this British brandy butter? Please leave a star rating below the recipe to share how you enjoyed it. 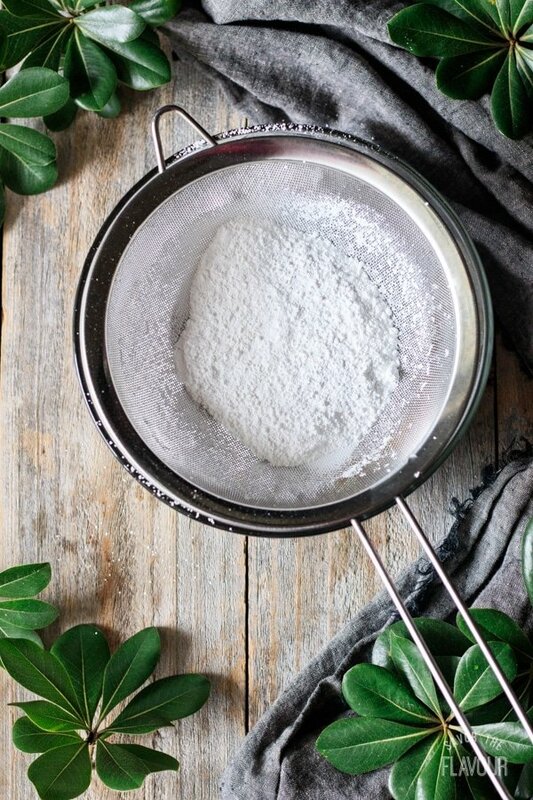 Place the softened butter in a mixing bowl. Sift the icing sugar on top of the butter, then beat with an electric mixer until fluffy and lightened in color. Scrape the sides and bottom of the bowl with a flexible spatula, then mix in the vanilla extract and orange zest. Mix in the brandy one tablespoon at a time until it reaches your desired taste. Taste and add additional sugar, vanilla, or orange zest as desired. Serve with hot plum pudding, bread pudding, mince pies, or Christmas cookies. If making ahead, store in the fridge until needed.